The header piping up to the air dryers is exposed to moist, hot air (temperatures can reach well over 150 degrees F). Copper, stainless steel and other piping materials that are less corrosive are recommended. If plain carbon steel piping is installed, then rust particles can pass downstream and interfere with the operation of condensate valves and wye strainers. The riser piping should connect to the top of the header piping and be one pipe size larger than the compressor discharge piping and/or overhead header piping. A drip leg with a drain is needed to prevent water from flowing back to the compressor. Mount valves in the highest horizontal piping (this avoids the hazard of opening a closed valve in vertical piping, and releasing trapped condensate to flow back into air compressors). All of the header main compressed air piping should slope 1/8" to 1/4" per foot down and away from the point of origin. Gravity and airflow will then carry condensate to the low points where a drop leg should be installed to allow for removal at accessible drop legs and drain points. These drops should be installed every 50 to 70 feet in the system and be taken from the bottom of the main line to insure as much removal as possible. The inlet piping for air dryers should connect to the bottom of the piping headers. Where multiple air compressors are to connect the riser piping to the top of overhead piping headers. The inlet piping for Air Dryer(s) should connect to the bottom of the piping headers. All of the header main compressed air piping should slope 1/8" per foot down from the point of origin. Gravity and airflow will then carry condensate to the low points where drop leg should be installed to allow for removal at to accessible drop legs and drain points. For larger plant, as the piping elevation lowers, a full size tee with a bottom drip leg preceding an elbow turned up to raise the pipe elevation. These drip legs & up turned elbows are typically 200 to 300 feet apart, i.e. the main piping slopes about 1/100 feet, and the elbow up raises the piping elevation 2 to 3 feet. Compressed air should flow through the straight ends of a tee and should never hit the back side of a tee. The air piping drops should connect from the top of the main piping. This prevents any condensate which forms in the main piping from flowing into the branch pipes. Individual shut-off valves should be installed (in the horizontal section of the connection piping above the main piping) at each drop pipe to isolate it from the rest of the system for maintenance. Pressure drop is proportional to the square of the velocity. Any high-volume, intermittent demand produces dramatic pressure drop during peak periods. Fittings, tee << 20 ft/second * "Dead head" tee (flow enters through side inlet of the tee) or use angled entry fittings to avoid flowing compressed air into "dead head" tee. 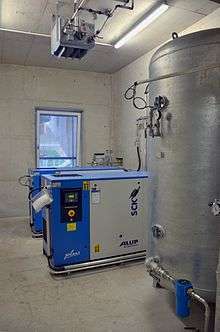 ↑ http://isi.fraunhofer.de/isi-de/publ/download/isi04p20/compressed-air-benchmarking.pdf "Compressed Air System Audits and Benchmarking Results from the German Compressed Air Campaign "Druckluft effizient" "